Why Spend So Much on a Moon? Was Titan a Big Failure? What would you do with $3.4 billion? A more important question might be, if you had the choice, why would you choose to spend that kind of money on a vague notion? Recently PBS aired a special documenting the failures and successes of the space program dealing with the exploration of Titan, the brightest of Saturn’s 56 moons. That much money and years of planning and brainpower went into the successful landing at the end of 2004. 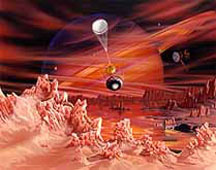 The program told of directing the probe through a space in Saturn’s rings. If it is missed, the probe would be destroyed by the fast-moving ice chunks and all would be for naught. It was certainly another triumph of human ingenuity to be able to accomplish this, for it took nine months just for the probe to travel the 745 million miles from earth. That said, what was the purpose of this expensive undertaking? Titan isn’t even a planet; it’s just a moon of a planet, measuring 40% of the earth’s diameter. The answer is found in the composition of its atmosphere. Titan is the only moon in the solar system with a thick atmosphere. The most abundant gas is nitrogen but in second place is methane gas. This is the required ingredient of earth’s early atmosphere if life evolved by accident. During this Titan work, vehicles failed and succeeded in landing on Mars, taking pictures, and examining the soil with spectrometers. They were scouring the planet for signs of water or water formed compounds. Without water, simple chemicals could not have floated together to form life. Since Mars is our most Earth-like neighbor, any evidence of life’s building blocks are greatly desired, for many have concluded that we are not going to get life to evolve on earth. Titan has evidence of both of water and of methane gas (containing carbon and hydrogen) so hopes rise that proof for life evolving by accident rest in these far away spheres. It is almost comical if it were not so expensively tragic. Pictures from Mars and Titan show a very bleak terrain. If life were there, it surely isn’t obvious! Further, Titan’s surface temperature is -288ºF and Mars averages -81ºF but reaches -200ºF, a bit too cold for life as we know it. Are they saying at those temperatures life might have floated together accidentally? Now imagine a space probe landing on earth to find signs of life. There is virtually no way to hind its presence!